Please meet my Labs, Francesca and Jazz Whacker. Fran turned 13 in May, 2014. She has retrieved 1827 birds during her hunting life. She is now retired, living easy at home. 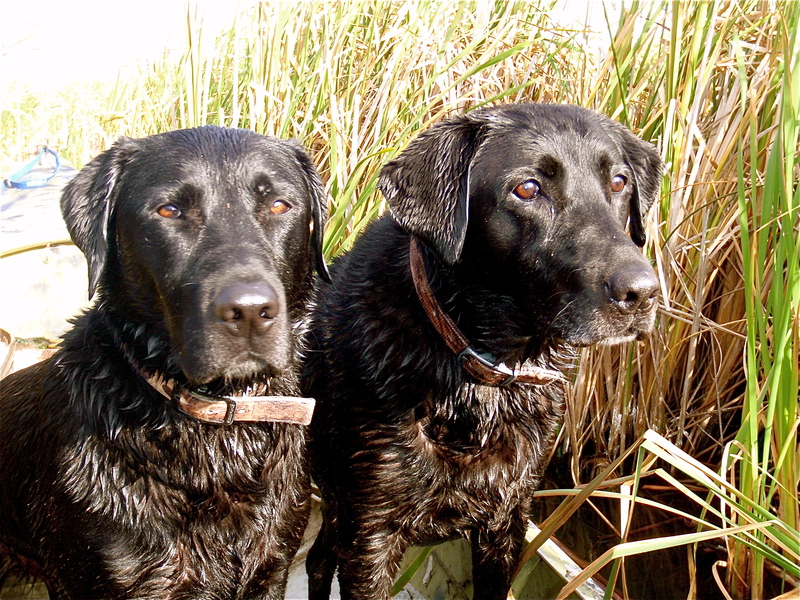 Jazz Whacker, the one on the left in the “best dogs ever” photo above, was rescued from a situation in North Dakota in 2007, and has become a fine hunter. Jazz turned 8 in December 2014 and has retrieved 701 birds. He is a pointing lab. Go to the “Books” page to read more about these amazing dogs. For basic information on Labrador retrievers, go to www.nationallabradorretrieverclub.com. A new book on Labrador retrievers is available. Google or Bing www.lulu.com or Barnes and Noble site and search “Is Life Worth Living Without Labs?” by JAY. Print and E- reader versions are available. A great gift for your doggy friends. There were three of them. And beautiful gals they were. One was a little smaller than the other two. Feeling a little sorry for the short one, I grabbed her up for a closer look. She reciprocated. She was a darling. For a while, I carried her around and then watched her moves in the yard. Satisfied, I turned my attention to one of the other gals. She was sturdy, with a pretty face. Unusual for a black, she had a small patch of white on her right hind toe. Odd I thought. Owner was inside with friend looking at old photos and talking modern photographic equipment. “Got her picked out yet Mister” owner asked. “No” I said, “need to check out one more”. I returned to the yard. SMACK! What the hell just hit me? WOW, the look of love! Cuddling the third lady in my arms, our eyes met. She had me with that beautiful face and eye contact. This little darling was going home with me. It was April 21, 2015, and I was at Faith Haven Kennels in Livingston, Montana picking a Labrador puppy; my sixth Lab and she would be called Cameron. Spring and summer were spent on retriever training drills and exercises. A painful morning but delightful afternoon, September 20, 2015, we were in Alberta, Canada for Cameron’s first duck hunt. In the morning Jim Claar and I hunted from a levee on the north side of a huge shallow lake. Ducks had been passing over this area from the big lake to a smaller impounded wetland north of our location. As I waded out to place a few decoys, Cameron swam along. As I put them out, she picked one up and headed back to shore. She was admonished, but to no avail. We had worked on leaving decoys alone in the driveway, then in a river during summer. Guess I should have spent more time on this drill. She retrieved more decoys, and that pained me! I dropped a gadwall down in the bulrush behind us, which I marked but she didn’t. I took her near the spot, tossed in a rock and said find the bird. She went in, found the bird and returned. Okay, her first retrieve. Our second hit was also a gadwall and it fell a ways past the decoys in choppy water. I waited till the wind blew the duck nearer to shore. I lined Cameron up, made sure she saw the bird and sent her. Successful retrieve. Ducks were flying the wetland pond behind us, so I moved there with Cameron. She had a good view of the pond and saw a pair of ducks flying the middle. I shot and hit a bird. It came down, splashed and flapped white-ish wings providing a good visible image. Cameron saw this action and I lined her up and sent. This third retrieve of hers was a classic 100 plus yard swim through submerged weeds, with return through 20 mile per hour tossed waves. A bonus was she retrieved a bull canvasback. In the afternoon, we hunted along a levee at Ducks Unlimited Enchant marsh. The wind was up to 30/40 miles per hour churning waves a foot high. Cameron retrieved a ring-neck and mallard on the lee side of the levee where visibility of downed birds was good. She was figuring out the hunting game. In mid-afternoon, she settled down some and started to watch for ducks to fly by. She saw a couple of downed birds hit the choppy water on the windy side of the levee. One was a ring-neck that dove a couple times. She stayed with it and made a fine retrieve. For her first day of duck hunting, she retrieved eight birds. Many hunters spend a lifetime hunting ducks and never shoot a canvasback. And, most retrievers never get the opportunity to retrieve a canvasback either. For our second day of hunting we went to the Vauxhall Ducks Unlimited marsh and hunted a favorite mid-lake point. The first duck shot and retrieved was another canvasback. Lucky us. So Cameron got a canvasback each of the first two days of her hunting career. For these first several days of Canadian duck hunts, she retrieved 32 birds. Oh, and some decoys. Later, she focused on the birds leaving decoys mostly untouched. But an issue now is her whining! Cameron’s next adventure was learning to work pheasants. On her Canadian hunts above, I had left my other Lab, Jazz Whacker, at home so I could focus more on her training needs. In early October, along with both dogs, I met upland bird hunting partner, Dan Herrig, at Malta. The plan was to have Jazz mentor and show Cameron how pheasant hunting was done. The first day we hunted a dried up wetland area with short and thinned out cattails. And the roosters really liked this cover. Dan and I filled our limits for two days in this relatively small patch. Cameron hunted back and forth with Jazz and checked in with me frequently. Jazz flushed three birds, retrieving the first two. The third one, Cameron saw the bird fall, marked it and made a fine retrieve. Our second day was very windy and hunting not good. On the third day, Cameron was hunting and scenting cover. She marked two falls, with Jazz getting one bird and Cam finding and retrieving the last one. Although her exposure to pheasants was brief, she did well. On our second trip to Canada, Ed Bangs, and Jim joined me for some of the hunts. I also had both Jazz and Cameron. This made it difficult to give the attention needed for managing Cameron. However both dogs got lots of ducks to retrieve. By Cameron’s third day, she stopped retrieving decoys as she focused more on ducks. Also a diving ring-neck gave her a great lesson of persistence. The bird dove 3 or 4 times with Cam staying with it. Finally she caught it by a wing tip and retrieved it. Overall, great experiences were provided Cameron on this second Canadian hunt. She retrieved 26 birds and could have been many more but for sharing with Jazz. Next adventure was more pheasant hunting with Jim in western North Dakota, and with more dogs and friends. At home or in motels, to this point, the dogs’ slept with me. Here, a barn with an indoor/outdoor kennel run was provided. Cameron and Jazz bunked out fine in the heated part of the kennel run. She adapted quickly. This heated part of the barn also had a couple of sinks and freezers where we cleaned birds and stored them. Dogs were warm in their kennel and we were warm and had running water to clean birds. Dogs could see what we were doing and we could talk to the dogs. Usually there were 5 to 7 dogs kenneled. Friends Kim, and Kent, had hunted this area for eight or ten years and had become good friends with several farmer/land owners. We had permission to hunt lots of private fields. Also, a fair number of North Dakota Fish and Game Department access easements call PLOTS are available to hunt. The area is farmed with small grains, sunflowers, and corn crops (providing food) mixed among fields of Conservation Reserve Program (CRP) grasslands (providing good nesting habitat). Shelterbelts around homesteads and in fields, and wetlands with cattails provide good winter cover for pheasant survival. Thousands of birds are produced each year. It’s a great place to pheasant hunt. I must add we are very fortunate. Nearly all the land in western ND is posted, not allowing entry. Most of these lands are leased to hunting clubs or operated as “paid hunting” areas costing big bucks. The “too many” pheasants can become a dog scenting issue. Pheasants have a pretty strong odor. With lots of birds criss-crossing cover; dogs get easily confused with too much scent. To the chagrin of owners, they lose control and go bonkers running ahead and flushing birds out of shotgun range. But so many birds are encountered that some do get up close and the three birds apiece limits are achieved. On the first day, Jim and I hunted a favorite cattail marsh and a CRP tract. These are places we have hunted for years with another Lab, Francesca who died October 2, 2015. I selected a spot in each field to place some of her ashes. RIP Frannie. Fran had put up lots of birds here for us in previous years. Today Jazz, with Cameron following, put up 35-40 roosters, many too far to shoot. We did get three however. On day 2, Kent and his Lab, Guy, joined us. We hunted a CRP field with adjacent wheat field. Lots of birds. Jazz hunted for Jim and I took Cameron and hunted in a different direction. She coursed back and forth in front of me and put up pheasants. She marked falls and made retrieves well. She’s coming along. We all got limits in two hours, a great day. The following three days Cameron hunted well, finding and retrieving a total of 11 pheasants for the trip. Jazz was too wild and out of control so stayed in truck two days. This trip ended our forays for upland birds. We’ll now focus on Flathead River ducks. Days were spent with Cameron alone, or with both dogs hunting ducks on the Flathead River near Dixon. It was difficult to manage two dogs so I usually alternated taking one dog for most hunts. I needed to pay attention to Cameron to manage her energy and whining. The whining is a problem I have not solved. She gets excited on the drive down to the boat launch and whines; and in the blind she whines with anxiety. More than once her whining and jumping shied off incoming mallards. These are training issues for 2016. Cameron hunted 15 days on the river and retrieved 18 birds. Two of those were Canada geese. One, a water retrieve in river current. The other was a goose that swam to the far shore and walked up the bank and took off across a pasture. When I boated over to the bank, she scented the bird up the bank, topped the hill and spotted the goose 150 yards away. She charged, bowling over the bird, recovered and grabbed it by the shoulder and returned it to me near the boat. Many of her mallard retrieves were in swift currents, some while swimming down cripples. Overall, Cameron retrieved 91 birds during the 2015-16 season. Some were assisted by Jazz but by the end of the season, Cameron was going solo. She figured out the hunting game and knows basically what to do. She got small ducks, diving ducks, mallards, Canada geese, and pheasants, a good mix of birds for her first hunting season. In 2016, training drills will concentrate on steadying, lining, handling, blind retrieves, pointing and other items. She runs to people and hops around them, but not on them. I need work on this problem. The whining is an issue I may not be able to correct. Suggestions on how to approach this would be appreciated. At 74, what on earth was I thinking; I was crazy for getting a new Lab puppy! There is so much energy and so many problems. A lot of time is needed for training. I could likely die before she was very old. Then what? It was a big commitment, and I couldn’t guarantee I would be around to finish the job. My selfish thinking was, I’m in good physical condition (which at this age is no guarantee) and the pup would get me up and going in mornings. It is a gamble. Luckily, I have two lady friends that love dogs; one especially loves black Labs and she offered to take and care for the her. That gal also has a sense of humor as she told me I couldn’t die until Cameron was at least two years old and with some energy dissipated. And the other gal, also with a sense of humor, loves Cameron very much. Of course, hunting is only one aspect of having a good dog(s). Cameron lives in my home and is family. She is a lover, liking her hugs and smooches. In the evenings she will snuggle up in my lap and nap. She is a blessing and I love her greatly. Good girl, Cameron. A friend suggested a nice walk down to Park Avenue and 38th street for coffee. Sure, my sister, Marcia, responded it is a beautiful day. It was in the Mid-1990’s and in New Your city. On the way, they passed a pet store and friend beckoned Marcia in for a look. They saw birds, cats, and other animals, and finally got back to the dog area. All the while, a little dog was loose in the store and kept following Marcia around. Kind of a nuisance! Sister kept tripping over the dog. They looked at all the dogs on display, with no intentions of getting one, and turned to leave. Here again was that darn little dog to step over. Marcia asked a nearby clerk what was wrong with this little guy? He’s a Chihuahua but he is too big for the breed. Many have looked but rejected him for his size. They proceeded to the coffee shop. Angst began to set in with Marcia as they had coffee. She’s had Maltese and Lhasa Apso dogs in the past, but had been seriously ill for several years and without dogs. She was feeling sorry and taking pity on the little pet store dog and suggested they go back to see him again. She made the buy and took him home! Billy Buddy settled into City apartment living and for many years made Marcia a fine companion. He got Marcia out for neighborhood walks twice a day. They would go over to the “grassy knoll” a couple blocks away where Billy would do his business and play with other dogs. When I would make my weekly Sunday call to sister, most of what we talked about was Billy Buddy. I hunt, and the dogs I’ve had were black Labrador Retrievers. I really don’t have a ‘thing’ for little dogs. But I was happy for my sister. Two events came together in late 2008. Marcia’s memory was failing and I was concerned about her being out on New York’s streets, getting turned around and not being able to find home. Also her apartment owners were upgrading and remodeling rooms and wanted to move her to another apartment two floors up. My son and I flew to New York to check the situation and visit with the apartment manager. Marcia looked at another apartment and became disturbed. They offered to buy her out of her apartment as an alternative, and she accepted. I made plans to move her and Billy to Missoula, and for her to reside in a nice 5th floor apartment at the Clark Fork Riverside overlooking the river. She moved here in January 2009. My sister (with Billy Buddy), daughter-in-law Suzanne and I made the plane trip back to Missoula from New York via Minneapolis on the last flight out on a very stormy winter night. I was a wreck, worrying about getting stuck late night in LaGuardia Airport. We got out and made connections in Minneapolis. We were all tired and on nerves. The best passenger was Billy. He rode his doggy travel bag like a trooper. And I was most worried about his barking or presenting other problems. Neither happened. At the Clark Fork Riverside, Marcia settled in and Billy was a social hit with other occupants. He is cute and a very engaging little dog. They have a nice riverside trail and grassy area to walk and the two could visit with folks. One of the apartment renters was an older, wheel chair bound gentleman named Gilbert. He was an Uncle of Jan’s, a friend of ours. She had moved him out from Pennsylvania. After 2 ½ years, Marcia’s memory worsened and was moved, with Billy, to an assisted living apartment unit. There, they had nice sidewalks and grassy areas to walk and someone to watch after them. But in time, Billy’s pulling and leash tripping led to several falls for Marcia so I needed to find him a new home. Marcia was saddened but understood the need to let him go. When Billy left, Marcia’s disposition brightened and she stopped smoking. Billy’s earlier positive companionship had become a negative for Marcia as her stress and mental condition changed. I mentioned this new home need to Jan and she said her Uncle Gilbert often commented on Billy. He offered to take him back to the Clark Fork Apartments’. I suggested to Jan that we try this for a week or so and see how they get along. Jan frequently asked her Uncle if she should find another home for Billy and he wouldn’t answer. Jan persisted and Uncle Gilbert finally told her that with Billy, folks downstairs in the lobby talked to him. Billy was a conversation starter; he opened a social world for Gilbert, which he relished. Well, it was a match made in heaven. Uncle Gilbert dearly loved Billy Buddy and had two loving years with him. At 96, after a short illness Gilbert peacefully passed with his dog Billy in his lap and his niece by his side. Jan was on a trip when Uncle Gilbert became ill. She called me requesting that I go to his apartment, get Billy, food and supplies and take him to Showcase Dog Grooming on Higgins. The owner, Kathi, and her crew had clipped Billy’s nails and cared for him before. I arranged for them to keep him until Jan returned in three days. Meanwhile a young lady, Kalina, 27, working at Showcase became attached to Billy and later offered to take and care for him after Gilbert died. Her family had dogs but she never had one. From her work in the dog business, she knew older dogs were difficult to adopt out. She thought Billy adorable and noticed he was comfortable and social around people. With Marcia and Uncle Gilbert, Billy was too well fed and unhealthfully over weight. Kalina managed his diet and walked him a lot. He lost at least two pounds and looked great. They bathed and groomed him and he looks like he’s only a year or so old. In fact, we do not know exactly how old he is. He is at least 15 years old, how many years over that is a guess. While Billy wears his special goggles and sits in his basket, Kalina bikes him to work each day. He takes his place lying on a bench with another “front room” dog and seems to oversee and command the business operation. I have only had big dogs, six black Labrador Retrievers. I have normally eschewed little dogs. They are barky and prone to nip at folks. My experience with this little dog has shown me that the size of the dog does not matter concerning the quality of relationship a human can have with their dog of choice. There is no doubt that Billy brought joy, pleasure, happiness and positive companionship to these three very diverse people. This New York City puppy came to the Wild West and won hearts, lots of hearts. Long live Billy Buddy and may he continue keeping people happy. This is a story for dog lovers. Well not really. A story for dog lovers that are hunters: well maybe not that too. A story for dog lovers that are duck hunters, oh, not that either. OK, a story for duck hunters that hunt ducks from a boat, preferably a metal boat. To hunt ducks, one must be very, very quiet and still. Movement and noise scare ducks. Not good! Many folks have dogs. And what do dogs do? They wag their tails and that’s normal. With Labs, they usually sweep the coffee table clear. Woe be that glass of wine! I have two black Labrador retrievers. And beautiful dogs they are. Normally around the house and other usual places, one, the boy I call Jazz, wags his tail all the time. It’s in constant motion. The other dog, the girl Francesca, wags her tail seldom or not at all. Why the difference? What’s this all about? The culprits in this story! Well, all that changes when we hunt ducks from my aluminum sport canoe. Ole tail wager Jazz goes silent and statute still and this is good. He’s intent on watching for ducks. Meanwhile ole non-wager Fran’s tail goes wild: thump, thump, thump on the side or seat of the metal boat. She’s watching for ducks too but her tail comes alive. Noise carries for miles over water in the marsh. Okay maybe not miles, but certainly a long ways when the point is to be very quiet so the ducks will come near the decoys. Well here I am shushing at thumper in the boat and making as much noise, or likely more noise, trying to get Fran to still her tail. It’s quite a show and the main reason I hunt alone. Not many can tolerate my fussing. To compensate for my incompetency, I hunt where there are a lot of ducks and not many other hunters. Of course this just increases my opportunity of scaring more ducks, thus teaching them to shy away from other hunters. Its my method of schooling the ducks because they get wise around me and ole thumper. This in turn, causes other hunters to hone their skills to a higher level so they can decoy in my schooled ducks. If they don’t, they don’t get many ducks. It’s my answer to conserving waterfowl. Alas, occasionally a few young ducks come in, I drop them and the two kids get a chance to swim and retrieve some birds. They love it. I love it. An Argentina hunting colleague of mine once told me–the life of the hunter is very, very hard. Yes, and it’s especially hard when you have ole tail thumper in the boat! Happy tails! Or should that be “happy trails”.